It takes a very skillful hand to be able to mix horror and comedy into a successful entertainment, but writer/director John Lafia doesn't have it. This trainwreck of tone whipsaws from wannabe horrific bloodshed to heavy-handed moralizing to stupifyingly uncomfortable attempts at slapstick humor. No one escapes from this mess untainted. It pretty much ended Lafia's big screen career, and star Ally Sheedy licked her wounds until getting a sort-of career resurrection in High Art. 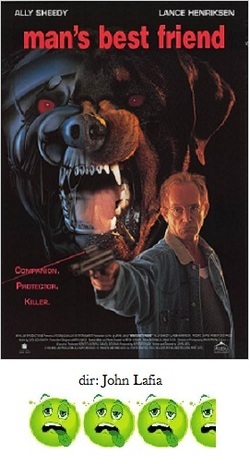 As for Lance Henriksen, this was just more of the same. As you could guess, this one is about a dog. But not just any dog. No, this one has been created in the laboratory using robotics and DNA splicing to be used as the ultimate military weapon. This pooch is massively strong, has computer-enhanced senses and can climb trees and eat cats whole, and let's not forget the abilitiy to urinate acid. How all these things would help the military is just one of the big questions the film neglects to answer. Sheedy plays a journalist (badly) out to expose the lab for inhumane animal testing and decides to rescue this seemingly normal dog, now named Max, and take him home; Hendriksen, of course, is the scientist trying to recover it. The whole film moves in fits and starts and never gains traction. Are we supposed to be afraid of Max? Sympathize with Max? Is Hendriksen the bad guy or the hero? Is Sheedy's character really supposed to be as stupid as she seems? The viewer is expected to pick all sides of all the issues and that just leaves a feeling of inertia and abject boredom. The crude attempts at physical humor (such as the 'seduction' scene with Max trying to bed a female poodle) just feel out of place. Man's Best Friend is one of those films where you really have to question the motives of the film makers. It's obvious they didn't consider what sort of audience they were making this movie for, and by trying to please everybody, they only pleased no one.